We should expect something exciting from Jessica Trombly this year. The Tufts soccer and track star from Nashua, New Hampshire has a knack for competing. Some might say it goes deeper than that. "She is psychotically competitive," said Kristen Morwick, the head women's track & field coach. "Yes, she's a natural athlete, but the level of her competitiveness is what sets her apart." During Homecoming Weekend on October 3, Trombly received the athletic department's Hester L. Sargent Award as the best female athlete of 2002-03. Now a senior, she is poised to culminate an outstanding athletic career in 2003-04. Whether she plays in another NCAA soccer tournament or wins a track national championship, perhaps both, her drive to succeed will be full throttle. "It's been better than I expected," the soft-spoken Trombly said about her accomplishments at Tufts. Given the standards she sets for herself, that's really saying something. 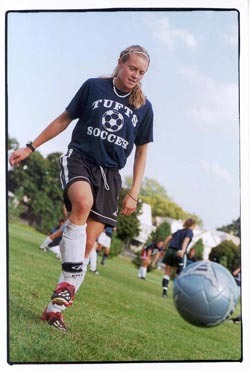 Within three months of arriving at Tufts for the fall 2000 semester, Trombly was playing in the NCAA Women's Soccer National Championship Game at Kraft Field in Medford. She assisted on the lone Jumbo goal in a 2-1 loss to the College of New Jersey. Tufts was defeated in the final seconds, but the team's run to the national final electrified the campus. "Our team was really, really close," Trombly said. "It was definitely the best team I've ever been on. Everybody got along and it showed in how we played. We clicked so well because everybody was friends." Trombly's bursts of speed to the ball as a freshman gave the Jumbos a new dimension. She scored six goals and eight assists for 20 points and was named the New England Small College Athletic Conference (NESCAC) Rookie of the Year. "For most freshmen coming in, it's an adjustment because the college game is more physical," said women's soccer coach Martha Whiting. "For Jess it was just a natural progression. She was the fastest player on the team." Just when it seemed too good to be true, Trombly's athletic ascension was detoured. She pulled a hamstring while training for track and had to sit out most of the indoor season. The rush of soccer's success was quickly replaced by the frustration of inactivity. Being unable to compete was unfathomable to her. "I'd mostly just injured my ankle in the past and that's definitely the type of injury where you can tape it up and keep running," she said. "It hurts, but you can keep going. I had always pushed through my injuries and it didn't matter, but with a hamstring it's different." Her will to compete would help her to rise above this. By February, Trombly was able to run the 400 meters without too much pain. She had never run the event, but it was her way to get back into competition. "It was a year-ending injury and we just "eked" her through," Morwick said. An "eking" Trombly was still faster than most members of the team. She joined the Distance Medley Relay (DMR), running the 400-meter leg. Along with Leslie Crofton, Sarah Deeb and Lauren Esposito, the DMR won the ECAC Division III Championship. The following week they earned All-America honors by finishing fifth at the NCAA Indoor Championships in Wisconsin. Their time of 12 minutes, 4.18 seconds was the second fastest in Tufts history. Trombly aggravated her hamstring again during the outdoor season, but was able to overcome it and help Tufts reach Nationals as part of the 4x400 meter relay. By the end of her freshman year, she had competed at NCAA national championship events in all three seasons. "When I was recruiting her, people were telling me that she is the type of athlete who only comes along once in a while," Whiting said. "Not every year do you find her combination of raw athleticism and work ethic." Trombly did not slow down in any sense after her smashing debut. She went on to share the team lead in scoring during her sophomore soccer season. In track she started training and competing in the heptathlon, an endurance test with seven events ranging from shot put to high jump to the 800 meter run. By the end of the year she had placed 12th in the heptathlon at the NCAA Outdoor Championships in Minnesota despite novice status in the event. As a junior last year she was again a leading scorer as the soccer team earned the second NCAA Tournament berth during her career. She scored the eventual game-winning goal against Williams College to help the Jumbos win the NESCAC championship. Then in one of the more remarkable athletic feats in Tufts history, she won five events at the 2003 New England Division III Indoor Track & Field Championships hosted by Bowdoin College in February. Winning the 200 meters, the 400 meters, the 55 meter hurdles, the long jump and the 4x400 meter relay was possibly unprecedented at the meet. "It was literally not only sprinting in the events, but sprinting to get to the events as well," Morwick said. "It was bananas." Because she has so much room for improvement, it is the heptathlon that stirs Trombly's competitive juices most. She earned All-America status and set a school record in the event with 4,773 points for a third-place finish at the NCAA Outdoor Championships in upstate New York this past May. She is aiming to win that crown in her senior year. Trombly also hopes to score enough points in the event to qualify for the Olympic trials in June. That's a mark Morwick said she would need to add over 400 points to her score to achieve. The sky is the limit for Trombly entering her senior season. She is one of the leaders of a soccer team that has a 47-19-2 record over the last four years and has an NCAA Tournament tradition. With five goals and one assist for 11 points this fall, she's tied for fourth on soccer's all-time scoring list with 56 total points. In track she is continuing a legacy of Tufts greats that includes national champions Vera Stenhouse and Caitlin Murphy among many others. Last year alone Trombly broke five school records and qualified for the NCAA meet in 11 events. "If you look at our honor roll, from the 55 meters to the 100, the 100 hurdles, the 200, the 400, the 400 hurdles, 500, 600, 800, the relays and more, she's either one or two on all those lists," Morwick said "We try and look at the history of the program and make it better. So this year she said, ‘I think I could even get the 1,000 record!" Trombly is an economics major with a fine academic record. Her plans for the future are not set in stone; she entertains thoughts of attending business school. But one thing she knows for sure is that she'll continue to compete as an athlete. In the meantime time flies, bringing the last of her undergraduate years. Trombly flies too, and the chances are good that her speed will give us something to marvel at again this year.